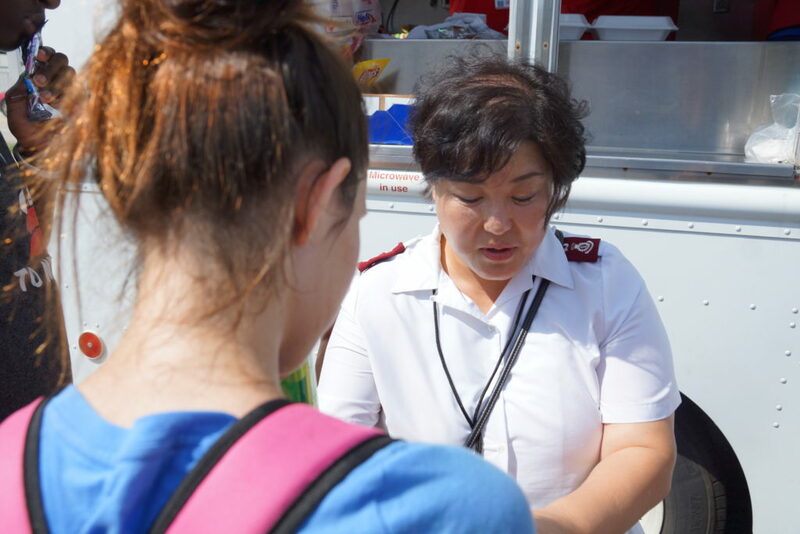 Sebring, FL (September 16, 2017) – Emotional and spiritual care during disaster and emergency situations is why The Salvation Army stands out after the unthinkable happens. Not only do survivors need their physical needs taken care of, but just having someone to talk to can make all the difference. Meridian, Mississippi Corps Officer, Major Young Soon Kim, on deployment in Sebring, Florida, takes a unique approach. She makes prayer bracelets from yarn and hands them out as she ministers to those coming to canteens for food and water. Turns out her forethought was correct. Major Kim noticed a family of three waiting in their car for a hot meal as the mobile feeding truck set up to serve. Major Kim showed the family her bracelets…blue, red, and yellow interwoven together. Major Kim explained they are Salvation Army colors but also represent the Trinity, the Father, Son and Holy Spirit. So, they got out of their car, held hands and Major Kim prayed one more time, this time with the daughter. Major disasters, like Hurricane Irma, can turn lives upside down. We know feeding the body is the immediate need, but feeding the spirit makes all the difference in putting lives back together.